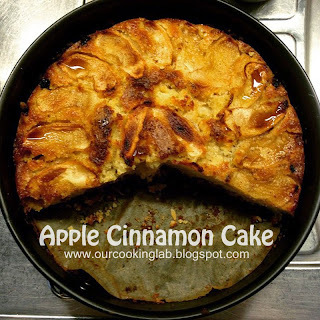 If you're looking for a failproof cake recipe, I think apple cinnamon cake is one of them. I can consider myself successfully made the cake in first try. It is yummy, moist, and easy to make. 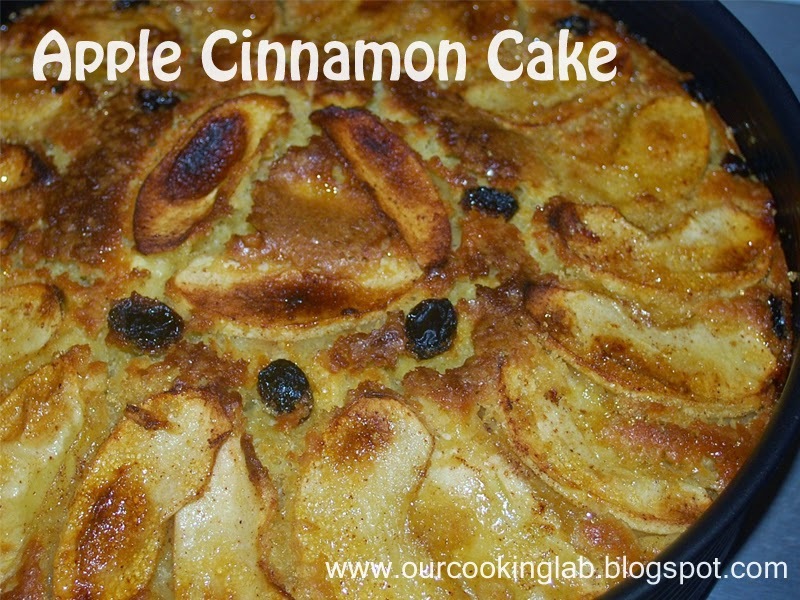 Apple cinnamon cake is perfect for breakfast or tea time, or maybe for hungry time in odd hour. Mix Ingredients A in separated bowl. Add a little bit of sugar if your apples are too sour. Mix ingredients B in a bigger bowl well. Add apple mixtures into mixture B. Butter and line a 24 cm diameter round pan with parchment papera and spoon all of the mixtures into the pan. Arrange the sliced apples, raisins and brown sugar on top of it. Bake it for 40 minutes. Turn off the bottom heat in your oven to for the last 5 Minutes. Raisins tend to burn if your oven ceiling is not too high. 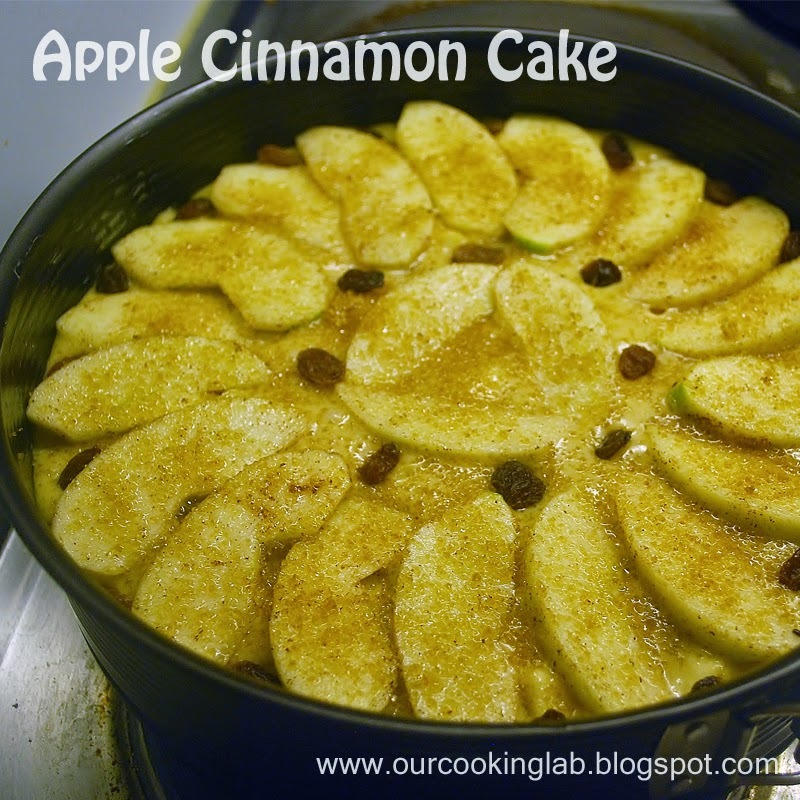 You can add more apples into the cake if you like more fruit in you cake composition. Store in fridge with cover or cling wrap to keep the cake moist. Thank you for visiting Our Cooking Lab. Please leave a comment and follow my posts by Email. I'm Valencia. This is a journal on my cooking experiences in my humble kitchen. Hopefully this blog may become your inspiration to cook and to share love with others through food. Our Cooking Lab. Simple theme. Powered by Blogger.